Live streaming to multiple platforms is easier than it sounds and it can bring you great results. There are many advantages to stream to multiple platforms when you plan to go live. Imagine going live on YouTube, Facebook and Twitch at the same time, how many people could you reach? But, there are a few setbacks when you stream to multiple platforms to keep your eyes on. On this blog post, we will show you why you should go live on more than one live streaming platform, what to look out for and how to do it. One of the advantages of live streaming to more than one platform at the same time is the potential growth of your audience. When you broadcast to multiple channels, it’s easier to reach people. In other words, when streaming to several platforms, you increase your chances of people watching your video. To stream to multiple platforms is a great way to create content for most of your online channels. It helps your online presence and exposure. Wherever people search for your content, they will find you. Having greater online exposure also makes you accessible at all times, regardless of the platform your viewers have available. The game-changing advantage of streaming to multiple channels is getting the most out of each platform. Facebook helps you reach a bigger audience because it favors live video. This platform also makes it really easy for users to share content, which increases your reach. YouTube is a video-first platform, which means it has all the right tools. It’s also easy to monetize and helps you create searchable content. That means people will find you on Google. Twitch has a massive active community, focused on niche live video. It’s a great platform to monetize your live streams and to interact with your audience. There are many other platforms to live stream and each of them has its advantages. If you’re thinking about going live on all of them at the same time, don’t. You should choose the channels that will bring you the best results. Here is why instead of live streaming to all of them, you should focus on the most important ones. What to look out for when live streaming to multiple platforms? Live streaming requires bandwidth and hardware capacity. Each platform that you stream to will require more bitrates from your internet. It also increases your CPU usage. So, if you try to go live on 5 platforms at the same time, chances are, it’s not going to work. You would need 5 times the bandwidth and a lot more power from your computer. Even if your equipment is able to do it, you’ll experience a lot of lag and viewers will not be happy with the streaming. An important part of live streaming is interaction with the viewers. When you’re live on 5 platforms at the same time, you won’t be able to keep up with the comments and questions. The whole point of going live is the real-time interaction. If you choose 2 or 3 main platforms to stream to, it’ll be easier for you to monitor your streams and take advantage of the live video format. Make sure you test it before going live, to make sure your hardware and internet can take it. How to stream to multiple platforms? With an encoding software like ManyCam, it’s easy to stream to multiple platforms at the same time. An encoding software is able to communicate with most live streaming platforms. It sends your stream to the platforms you choose. For example, ManyCam is integrated with Facebook, YouTube, and Twitch. Which means, to go live, all you need is to press the broadcast button and log in to your accounts. 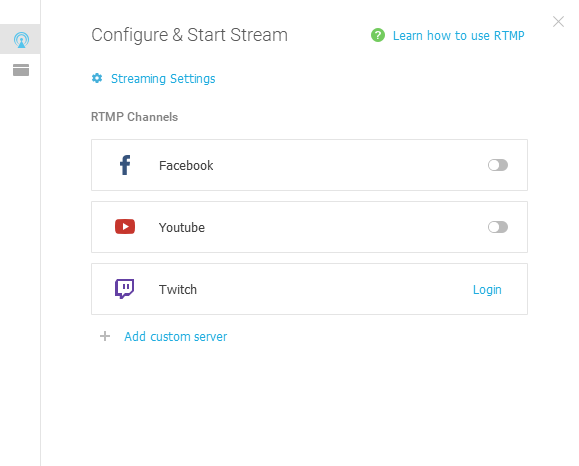 For other live streaming platforms, you’ll need to add a custom RTMP server on ManyCam. It’s easier than it sounds. RTMP is a protocol that provides high-performance transmission of video, audio, and data between encoder and server across the internet. To establish this transmission, you’ll need the stream key provided by the streaming platform. What’s a stream key and how can you get it? The stream key is a code that connects the source of the video and audio to the website or software. 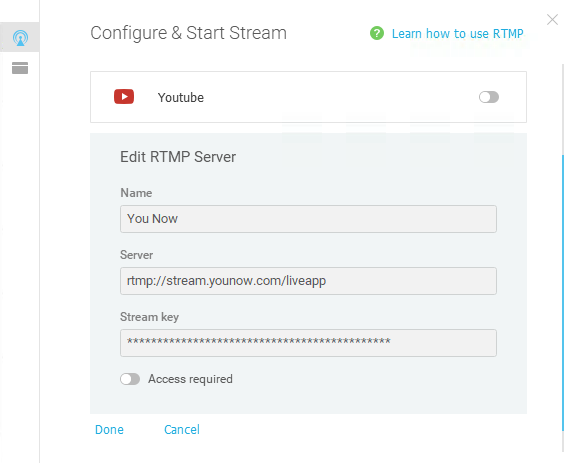 For example, if you want to broadcast to YouNow, you’ll find your Stream Key under settings. You can copy that and paste it on ManyCam, along with the stream URL, to create the new channel. As you can see, it’s easy to stream to multiple platforms and it can help you grow online. Whether you want more viewers, shares, likes or overall online exposure, going live on multiple channels is the way to go. Remember to check if your internet connection and your equipment can handle the extra work involved in multiple channel broadcasting. Let us know how it goes in the comment section below.